actual technical guidelines. This analysis includes the uncertainties associated with the computation and measuring methods in relation to the determined energy yield over a long time period. But like weak wind years in the recent past show, it is just as important to consider a comprehensive risk analysis to obtain an understanding of the annual irregularities (fluctuation) of the wind resource which is especially high in moderate climate zones. How sure are we that a predicted long term annual yield can also be really achieved in the next 2, 5 or 10 operational years? AL-PRO uses spatially and temporal highly resolved information and advanced mathematic methods like neural networks to determine the long term climatic history of your site. 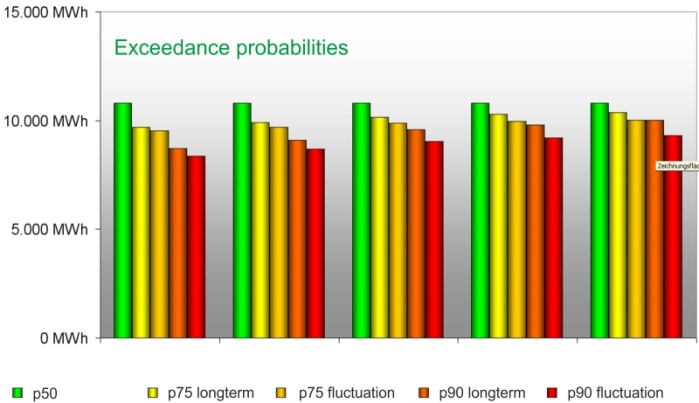 Based on this we compute the probabilities of excess and deviation with regard to obtaining the calculated long term annual yield in each desired level (e. g. P50, P75, P90) and for each desired time period. This analysis is possible for yield determinations completed by AL-PRO and also for yield determinations completed by other consulting offices, provided they have been prepared according to the current standards and technical guidelines. In addition we analyze monthly and seasonal yield fluctuations that can be expected for your wind farm.